Former ambassador to Malaysia John R. Malott's piece on the One Malaysia concept and its attendant problems (The Wall Street Journal, February 8, 2011) did not shed anything new on the subject. He merely regurgitated information acquired from here and there. For those who wanted new insights into the state and study of ethnic relations in Malaysia, Malott's article was disappointing. The recent Interlok controversy prompted me to ask Distinguished Professor Datuk Shamsul Amri Baharuddin, founding director of the Institute of Ethnic Studies at Universiti Kebangsaan Malaysia, to explain the recurring ethnic tensions in Malaysia, a point which Malott elaborated with relish. See the article (Learning Curve, New Sunday Times, February 13, 2010) below for his views on the subject. The last bibliography on ethnic relations in Malaysia was published in 1992.The compiler was Tan Chee-Beng and the title, appropriately enough, is the Bibliography on Ethnic Relations with Special Reference to Malaysia and Singapore. Regrettably, an updated version has yet to appear. “Bibliographies tell a lot about the state of a discipline at a point in time. 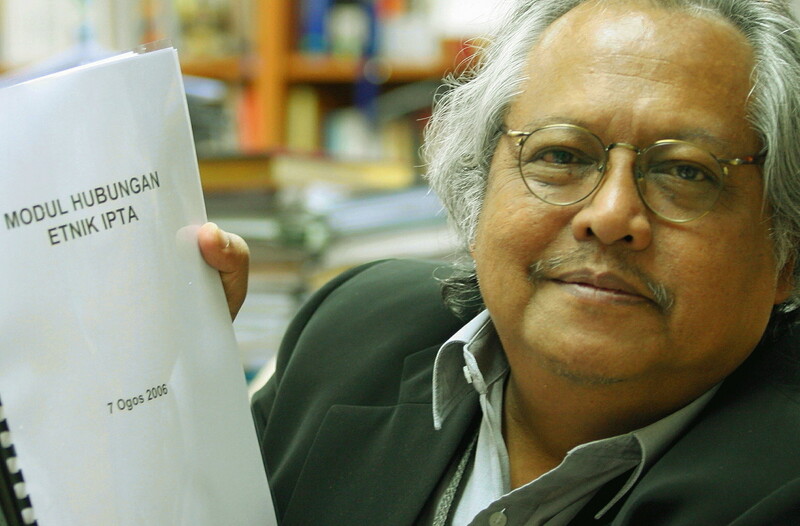 Can you imagine the level of our knowledge about ethnic relations in this country?” asks Distinguished Professor Datuk Shamsul Amri Baharuddin (picture), who is the founding director of the Institute of Ethnic Studies (or KITA) at Universiti Kebangsaan Malaysia. Malaysia’s inability to bring up to date an important text such as this one suggests “a deep-rooted knowledge problem”, says Shamsul, who is also the chief editor of the ethnic relations module. And a thorough knowledge of Malaysia’s ethnic diversity is sorely needed to deal with tensions that occur every now and again, he adds. The failure to update the 1992 ethnic relations bibliography and the frictions that arise as a result of differences in a plural society — the Interlok dispute and the hair-trimming incident involving a Sikh teenager being the most recent — are a sad commentary not only on the state but also the study of ethnic relations in Malaysia. The quarrel about the move to adopt Datuk Abdullah Hussain’s novel Interlok as a Malay literature text for fifth-formers, or any others of that ilk, illustrates the “stable tension” theory that Shamsul posits. The theory holds that ethnic tensions will take place from time to time but they are manageable provided Malaysians take measures to ease them. For Shamsul the first step towards becoming "mature” is to have a sound grasp of the issues in question. “We cannot make sense of the situation without deep and researched-based knowledge. We cannot survive on racial prejudices and communal stereotypes,” says Shamsul. Malaysians tend to view their “other” through racial prejudices, ethnic slurs and stereotypical images of the other’s behaviour. KITA is ideally placed to craft a framework for problem-solving. One of its projects in 2009 was the Monitoring Ethnic Relations System (MESRA for short) which acts as an early warning system for issues linked to ethnic relations in Malaysia. The Australia-based Institute for Economics and Peace (IEP), which produces the annual Global Peace Index (GPI), is interested in the scheme. The two institutes will sign a memorandum of understanding soon to collaborate on endorsing a part of MESRA as a Country-based Peace Index to complement the GPI. KITA also hopes to study Malaysia’s intellectual history besides finding out how “mundane activities” such as inter-racial and inter-ethnic marriages play their roles in fostering national unity. It wants to do more and Shamsul is brimming with ideas. But KITA faces financial and manpower constraints. “We are only a small institute in UKM. If the government is really interested in resolving ethnic conflicts, it should elevate KITA to a national body. A discussion on ethnic relations raises many important questions but there are no easy answers. In the case of the Interlok squabble, it has nothing to do with the novel, says Shamsul, who is a member of an independent panel to amend Abdullah's work. Instead, it has to do with the “dividedness” of Malaysia’s ethnic groups, as Shamsul puts it. “We are not a homogeneous society. The Malays are one group of people but there are many types of Malays, and the same is true of the others.” Even among the Indian community there is no consensus on the choice of Interlok as a text for the literature part of the subject Bahasa Malaysia for fifth-formers. Some are against it while others are not. Similarly, every Malaysian has his or her own vision of a national identity “based on a particular ideological framework” and the various attempts to construct this from the perspective of each public interest group represent “many nations-of-intent”. The non-Malays prefer a definition that accords the “culture of each ethnic group in Malaysia a position equal to that of the Bumiputera,” writes Shamsul in his essay “Nations-of-Intent in Malaysia”. The suggestion that “Chinese language and rituals be an integral part of the national identity” is a case in point. Interestingly, the tourism industry has managed to explain Malaysia’s ethnic and cultural diversity through traditional dances, folk songs and construction of ancestral villages, among others. And the main beneficiaries of this are the tourists. “But this diversity has never been really captured research-wise,” says Shamsul, who recently examined a PhD thesis on the Indians in Malaysia. The postgraduate had assumed that the divisions within Malaysian society are straightforward and did not show any understanding of the “dividedness” that exists in each community. Dec 31, 2014, the last day of the year and the end of my one year stint at The Rakyat Post , an online news portal. Educational is the best way to sum up my year at The Rakyat Post. Leaving your comfort zone is intimidating at first; it has a steep learning curve. But now I wish I had done it sooner and the whole exercise reaffirms my motto: “learn, learn, learn”. Einstein was spot on when he said, “Learning is not a product of schooling but the lifelong attempt to acquire it”. When I left theNew Straits Times to join The Rakyat Post on Jan 3, 2014, I didn’t know what to expect. Nelson Fernandez, also known was Mohd Ridzwan Abdullah, had invited me to join him at the website this time last year. He was charged with assembling a team to provide content for the portal. And I am glad I said yes. Switching from traditional journalism to online journalism is challenging, as anyone who had made that transition will tell you. Popular businessman Dato' Gary Thanasan held a social gathering in celebration of Diwali at his residence in Petaling Jaya yesterday. The above picture shows Gary, who is holding his daughter, with Prestige magazine editor Saleha Ali and journalists Yani (Bernama), Suraya (Life & Times editor) and Meena (Life & Times). Miss Malaysia (Universe) 1990 and Mrs Malaysia (World) 2004 Dato' Anna Lim came with her husband Dato' Jeffrey Lim and their two children. The friendly pair sportingly posed for a picture. Yani baked Gary, a former radio and TV show host, a classic dessert -- buttery rich Pineapple Upside Down Cake -- which brought back many childhood memories. She is pictured here with Meena, who came to the party in her usual Bollywood style. It was really a nice evening! I am interested in the experience and activities that are typical of all people's existences. Stories of joy, hope, accomplishments and tragedy inspire me to enrich my own life. This blog aspires to capture the essence of everyday life. Thank you for your interest. "All things are bound together; all things connect."